Thinking about going to go to University to study science, you may want to reconsider. Become a science fiction writer instead. Science has completely lost its credibility. In biology, there is a general rule of thumb that animals tend to become smaller in warmer climates: an idea known as Bergman’s Rule. Usually this trend can be seen among animal species that live over a range of latitude or altitude, with individuals living at more northern latitudes or higher up cooler mountains being slightly larger than those below, for example. Quite why this happens is not clear, but it prompted one group of scientists to ask the question: would animals respond in the same way to climate change? 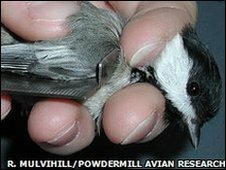 To find out, Dr Josh Van Buskirk of the University of Zurich, Switzerland and colleagues Mr Robert Mulvihill and Mr Robert Leberman of the Carnegie Museum of Natural History in Rector, Pennsylvania, US decided to evaluate the sizes of hundreds of thousands of birds that pass through the Carnegie Museum’s Powdermill ringing station, also in Pennsylvania. They examined the records of 486,000 individual birds that had been caught and measured at the ringing station from 1961 to 2007. These birds belonged to 102 species, arriving over different seasons. Each was weighed. It also had the length of its wings measured, recorded as wing cord length, or the distance between the bird’s wrist to the tip of the longest primary feather. Their sample included local resident bird species, overwintering species, and even long distance migrants arriving from the Neotropics.